This week, I’m exploring the yarn of the week, Universe, by Universal Yarns, and what is the best bind-off or cast-off to use with a yarn like this. Universe is a glammed-up linen and cotton blend that is perfect for lace knitting and warm-weather knits. I love how it reflects colors from its surroundings. One characteristic of Universe is that it isn’t elastic. A bonus of this is that when knit, Universe makes a light, airy fabric with a lot of drape. Something I’ve learned to be careful about when working with a yarn like this is which bind off to use. I suppose that the cast-on you choose to use with Universe is important too, but I think that it depends on the kind of edging your piece needs to have. I used the long-tail cast-on and size 0 [2mm] needles and the cast on was snug. I was just making a swatch, so it didn’t matter, but a knit-on cast-on or cable-cast on would be good to use with the bind-off that I finally decided would be the best; But I’ll talk more on that later. Let’s start with the swatch I made. I tried garter stitch on small needles. 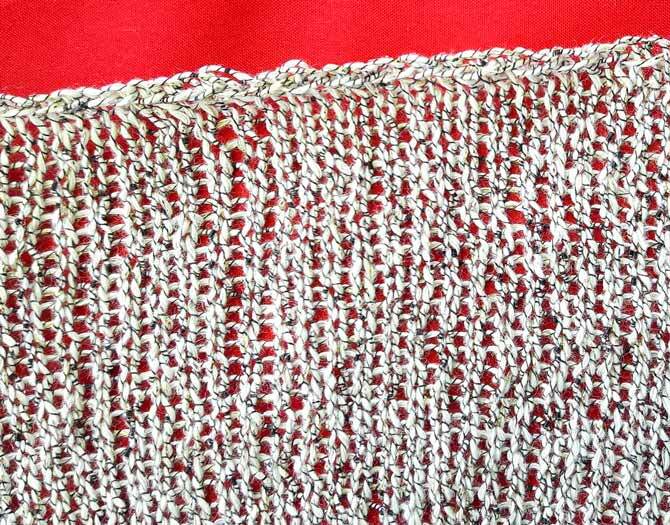 It created a lovely, structured edging for the swatch that still has drape and movement. I then changed to size 5 [3.75mm] needles and worked in stockinette stitch. In my opinion, this was one or two sizes too large for this yarn, at least for the way I knit. It was challenging to keep my tension even. 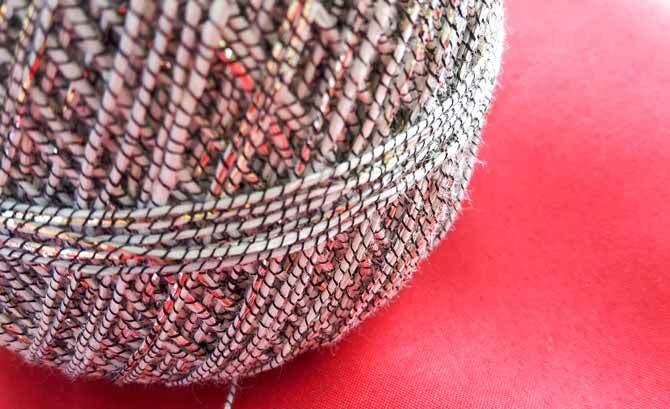 Yarns made of linen and cotton, have no stretch or memory, so when a stitch comes out a little looser than its neighbors, there’s nothing pulling it into a size consistent with those around it. I think 3mm needles (nearest US equivalent is size 3) would be best for me to achieve a nice, consistent tension. That said, if I was knitting lace with lots of yarn overs, I would for surely use 3.75mm needles. 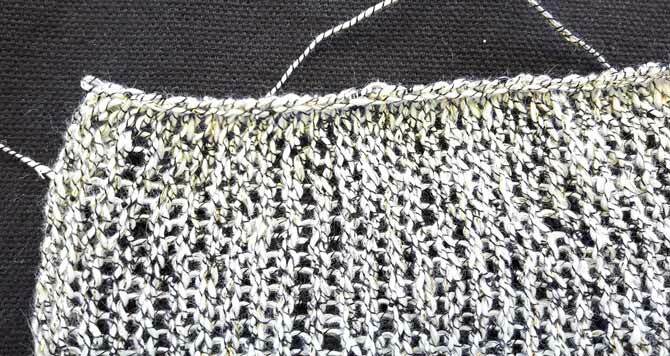 The evenness of each individual stitch isn’t as crucial when there are yarn-overs as it is in stockinette stitch. So which bind-off is the best one to use with a non-stretchy yarn like Universe’s linen cotton blend? I first tried what I would call the “normal” bind-off where you knit 2, pass the first stitch over the second one; then you knit one, and pass the previous stitch over the one just knit and so on. However, just for fun, I bound-off on the purl side. This resulted in that ever-so-frustrating puckered edge. You may have done this on a neckband only to have your eyebrows (and, in my case, beard) shaved by the bound-off edge. I then tried the following bind-off: I knit 1 stitch and returned it to the left needle and then it and the next stitch together (k2tog). Then, I returned that stitch to the left needle and knit 2 together and so on. This created a slightly looser bind-off and what I would describe as a slight bouclé edging. Finally, I tried the following and I do believe that it is indeed the best bind-off to use with non-elastic yarn. I knit the first stitch and returned it to the left needle purlwise (or basically through the front loop of the stitch on the right-hand needle with the needle points facing each other). Then I knit 2 stitches together through the back loops, returned this stitch to the left-hand needle (purlwise, again), and knit 2 stitches together through the back loops. Eventually, I developed a rhythm which involved fewer movements because, as I returned the stitch to the left-hand needle I also inserted the right-hand needle into the back loop of the next stitch, making everything set to knit the 2 stitches together through the back loops. As you can see above, this bind-off doesn’t pucker — it lies flat and has a nice finish. I would recommend this bind off for any project using cotton or linen or any other non-elastic yarn. When you encounter a characteristic about a yarn that at first gives you grief, don’t give up on it: look for a solution to the challenge. In upcoming posts, we’ll look at how great Universe looks as knitted lace, something that it comes by naturally.